The Scotland head coach says his side need to make sure they’re better the next two times they face Ireland. Townsend speaking at the post-match press conference earlier. A CASE OF WHAT could have been for Scotland — a missed opportunity not only to truly push Ireland here but to build further on the progress they’ve made under Gregor Townsend’s tutelage in the last 10 months. As it was, the visitors were left to rue their lack of accuracy and profligacy, particularly in the first half, when Townsend’s side spurned gilt-edge opportunities to cause Ireland damage. While Ireland were typically clinical, scoring two tries in each half, Scotland butchered several try-scoring chances at the Aviva Stadium and that ultimately proved the difference between the sides. After Jacob Stockdale had telegraphed Peter Horne’s floating pass out right to intercept and open Ireland’s account, the Scots were further guilty of shooting themselves in the foot; their attacking edge from the famous win over England had evaded them. The most glaring example of this came in the first half, when Finn Russell took a quick throw to himself, flung it infield for Sean Maitland, who in turn found Huw Jones on the far touchline. The centre saw the space in behind the Irish defence, delicately chipped over Keith Earls to collect his own kick and then slalomed inside the covering Rob Kearney. Having drawn the last defender — Johnny Sexton — he had the simple task of offloading inside for Stuart Hogg, who would have run it home uncontested, but instead waited too long and the final pass went to ground. It fired a warning to Ireland, but there were further missed chances before debutant Blair Kinghorn finished superbly in the corner. Townsend was philosophical afterwards, preferring to focus on the positives. “We obviously missed opportunities, we all make errors,” the Scotland head coach said. “We played some outstanding rugby today, just disappointed we didn’t have one more two more three more tries on the scoreboard which would have made it a very interesting game in the last 10 minutes. Kinghorn’s second-half try arrived courtesy of a perfectly-executed move from a close-range set-piece, with Horne, Hogg and Maitland all lining up directly behind the scrum before switching to the right after a solid shove from the forwards. “We are proud of how the team played but there is a realisation there is more work to do,” Townsend continued. “We’re three or four years behind Ireland in terms of what they have done and achieved and their experiences of the last few years. Captain John Barclay echoed those sentiments, but looked back on his side’s missed passes with frustration. “The score line didn’t show the competition in the game,” he said. “I think they had a few chances, an intercept and they took all of them. We probably had four chances, three clean two-on-one chances and we took one so to me that’s the difference. “They are a very good team. They are a fantastic side and we knew when we got chances we had to take them especially against a defence as good as theirs. The 2019 World Cup opener between the sides is shaping up to be a belter. 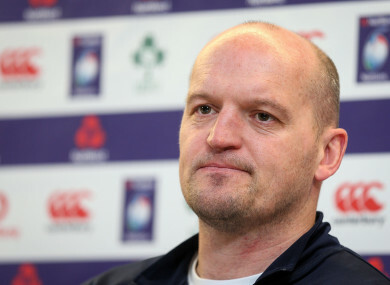 “Ireland are an excellent side,” Townsend added. “England are an excellent side,Wales are an excellent side. It’s a brilliant championship, competitive games and different styles and the quality of opponent is really high. Email “Townsend rues missed passes, admits Scotland are 'three or four years' behind Ireland”. Feedback on “Townsend rues missed passes, admits Scotland are 'three or four years' behind Ireland”.